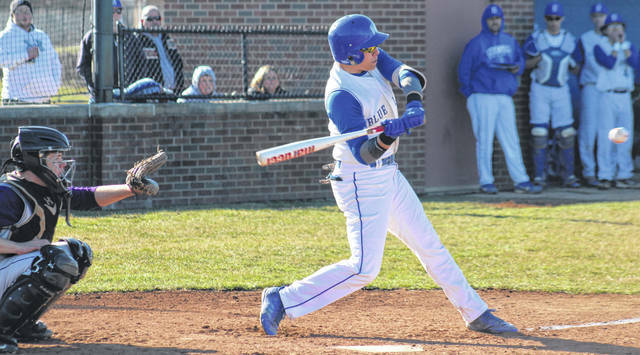 Washington’s Tyler Rood takes a swing at a pitch during the Blue Lions’ season-opener against Unioto Tuesday, March 26, 2019 at Washington High School. With their season-opening game at Madison Plains rained out Monday, the Washington Blue Lion varsity baseball team hosted the Unioto Sherman Tanks Tuesday. This game was scheduled to be played at Unioto H.S., but was moved to W.H.S. as Unioto’s field was unplayable. The Shermans won the game, 6-0. Unioto scored one run in the top of the first and that proved to be the winning run. Bailey Roberts started and took the loss for Washington. He pitched four innings with one hit and four runs (one earned). He struck out five and walked three. Brock Morris pitched two scoreless innings with one strikeout and R.G. Crabtree pitched one inning with two hits and two runs (one earned) and one strikeout. Lambert started and went the distance for the win for Unioto. Over seven innings, he allowed two hits, struck out eight and walked one. Offensively for Washington, George Reno and Roberts each had one single. Unioto added three runs in the fourth and two in the seventh. “Unioto is a quality program,” Washington head coach Mark Schwartz said. “They have a strong tradition. We faced a very good team tonight with a very good pitcher. “We only had two hits,” Schwartz said. “We played some young guys just getting their first taste of varsity experience and they played well. They did what we asked. “We just had too many errors early,” Schwartz said. “Bailey pitched a heck of a game, then Brock and R.G. came in and did their job. The next game for the Blue Lions will be at home Friday against Zane Trace at 5 p.m. The game for Wednesday at home against Eastern Brown was cancelled by Eastern Brown, according to Coach Schwartz. The game at Logan Elm, scheduled for Thursday, has been postponed due to the Washington High School marching band taking part in the 100th annual Findlay Market Parade in Cincinnati prior to Reds opening day. Washington will play Circleville at the VA Stadium in Chillicothe Saturday at 6 p.m.
Offensively for Washington: Karson Runk, 0-3; George Reno, 1-3, 1 sb; Tyler Rood, 0-3; Ryan Schwartz, 0-3; Bailey Roberts, 1-2, 1 bb; Eli Shaw, 0-3; Hugh Silberman 0-1; Brock Morris, 0-1; R.G. Crabtree, 0-1; Tyler Tackage, 0-2, roe; Cortez O’Flaherty, 0-2. Offensively for Unioto: Debord, 1-3, 2 runs, 1 3b, 1 bb; Keiser, 0-3, 1 run, 1 bb; Debord 1-4; McCloy 0-4, 1 run, 2 rbi; Lambert 0-3, 1 run, 1 bb; Longcoy, 0-2, 1 run, hbp; Lambert, 1-3, 2 rbi, 1 2b; Schobelock, 0-3; Dailey, 0-3.